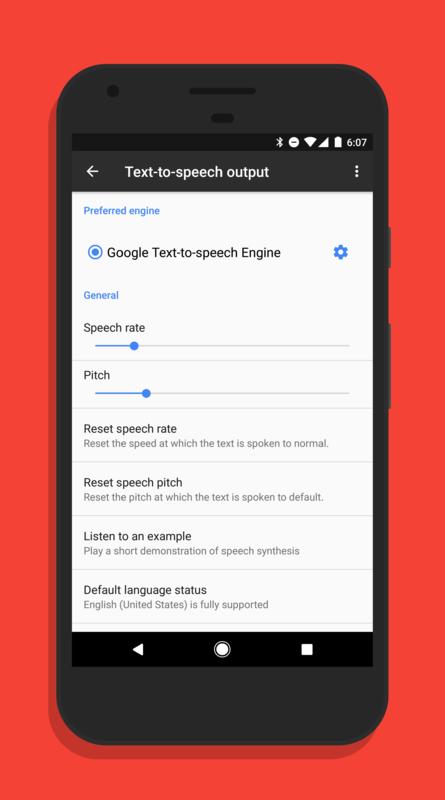 Google Text-to-speech is not an app you probably do a lot of tweaking on but it is an important foundational app for Android. The app essentially serves as an engine for other apps so they can read text on the screen aloud to you. For example, if you are in Google Play Books and want the app to read aloud a book, this is the app that makes the magic happen. Or Google Translate to translate text. So when an update comes out for it, it is important to get it. The latest update to Google Text-to-speech is rolling out now and it is version 3.11.12 for those keeping score at home. It comes with several new tweaks for users as well as new languages. First, let’s cover the languages. In this update, support for Bangla (India, Czech, Khmer, Napali, Sinhala and Ukrainian have been added to the engine. Along with this, Google has added intonation control over several more voices that are in the engine and have made general improvements on many of the voices in the app. Google did not specifically call out which languages were impacted by these latter two. text, turning off number processing will be pronounced “oh four slash eleven slash two thousand seventeen”. This is more-or-less a personalized settings so you can set it up the way that is most comfortable for you as text is being read to you. Do note, however, that this feature is only in English voices. This update is rolling out now and you should see it over the course of the next couple of days. To adjust settings, just go to Settings and search for text to speech.